Archaeological excavation at Ain Boucherit, Algeria. Photo by Mathieu Duval. When did early humans first arrive in the Mediterranean? 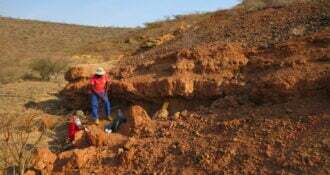 New archaeological evidence published December 14 in the journal Science and funded in part by The Leakey Foundation indicates their presence in North Africa at least 2.4 million years ago. This is about 600,000 years earlier than previously thought. 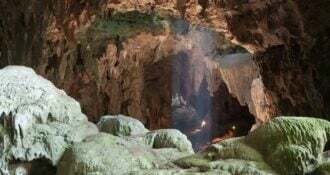 The results, from the Ain Boucherit site in northeastern Algeria, provide new information on a time window involving the earliest representative of the Homo genus. These discoveries are the result of excavations and intensive investigations performed under the umbrella of the Ain Hanech project since 1992. Located north of El Eulma city, the area was previously well known for providing stone tools and cut-marked bones dated to about 1.8 million years ago (Ain Hanech and El Kherba sites, see map above), which have been until now the oldest occurrences in North Africa. In 2006 and 2009, new artifacts were found at Ain Boucherit, a few hundred meters from the other sites. They were distributed in two layers below the previous archaeological findings, suggesting an even older human presence in the area. Excavations of the lower (known as AB-Lw) and upper (AB-Up) archaeological levels yielded more than 250 stone tools and almost 600 fossil remains. A wide range of animals was identified, including elephants, horses, rhinos, hippos, wild antelopes, pigs, hyenas, and crocodiles. These animals currently occupy a relatively open savanna type habitat with permanent water nearby, suggesting similar conditions in the past. The stone tool find includes mostly chopping tools and sharp-edged cutting tools used for processing animal carcasses. Those tools are made of limestone and flint that were most likely collected nearby from ancient stream beds. They are typical of the Oldowan stone tool technology known from East African sites and dated to between 2.6 million and 1.9 million years ago. But the Ain Boucherit find also shows some subtle variations, in particular with the presence of very peculiar tools of a spheroidal shape whose function remains unknown. Two examples of stone tools from Ain Boucherit. An Oldowan core from which sharp-edged cutting flakes were removed (left). Sharp-edged cutting flake that may be used for butchery activities on the bones (right). Photos by Mohamed Sahnouni. Some of the fossil bones show very specific marks that could not be of natural origin, but rather the result of intentional activity. Two types were identified. The first were cutmarks made from sharp-edged flakes, suggesting skinning, evisceration and defleshing activities (pictured below). The second include percussion marks made from a hammerstone, suggesting marrow extractions. These show the use by early hominins of meat and marrow from animals. This is consistent with other studies from broadly contemporaneous East African sites. Dating the site was quite challenging, but the relative positions of AB-Up (within Olduvai event) and AB-Lw (a few meters below Olduvai) allowed us to derive an age of about 1.9 million and 2.4 million years ago, respectively. This new discovery modifies our understanding of the timing and diffusion of the Oldowan stone tool technology throughout Africa and outside the continent. By pushing back by about 600,000 years the earliest occurrence of Oldowan tools in North Africa, the age difference with the oldest East African evidence suddenly becomes relatively small. This indicates at least a somewhat rapid (or, more rapid than previously thought) expansion of this technology from East Africa, although a multiple origin scenario of stone tool manufacture in both East and North Africa might even be possible. As a consequence, the first settlements of the southern margin of the Mediterranean area now appear to be much older than their northern counterparts. The oldest evidence from southern Europe does not exceed about 1.4 million years ago (Atapuerca and Orce sites, in Spain), while the hominin fossils found at Dmanisi in Georgia, at the gates of Europe, are dated to 1.8 million years ago. Since no hominin fossils were found at Ain Boucherit, we can only speculate about the possible makers of these Oldowan stone tools. The hominin fossil record in North Africa is extremely poor, and there is currently no fossil reported in the age range of Ain Boucherit. The oldest fossils found in Algeria are dated to about 700,000 years ago. They were found at Tighennif (formerly known as Ternifine, see map above). 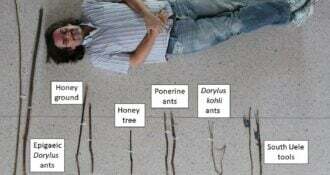 If their attribution has changed over time (initially Atlanthropus mauritanicus and nowadays Homo erectus or early Homo heidelbergensis depending on the authors), these fossils are too young compared with the Ain Boucherit discoveries to support any kind of connection between the sites. All the early hominin fossil remains found in the Mediterranean area in association with Oldowan stone tools are significantly younger than Ain Boucherit, by at least 1 million years. The oldest Western European evidence such as the partial mandible found at Atapuerca Sima del Elefante, Spain, and the isolated deciduous tooth from Barranco León, southern Spain, are dated to about 1.2 million and 1.4 million years ago, respectively. Consequently, the best candidates are most likely to be found in East Africa, despite their geographical distance from North Africa. Several hominins are broadly contemporaneous with Ain Boucherit (a good overview may be found here), including australopithecines and different members of the genus Homo such as Homo habilis, Homo rudolfensis or the undefined early Homo from Ledi-Geraru, Ethiopia. That said, we cannot rule out the possibility that the stone tools at Ain Boucherit come from another hominin species, belonging or not to the genus Homo, that has not been found yet. We hope our future excavation at Ain Boucherit will give us the opportunity to identify these stone toolmakers. 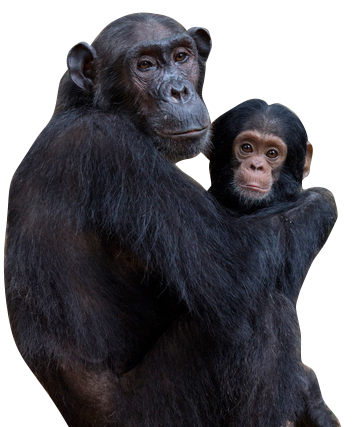 This research was funded in part by The Leakey Foundation.